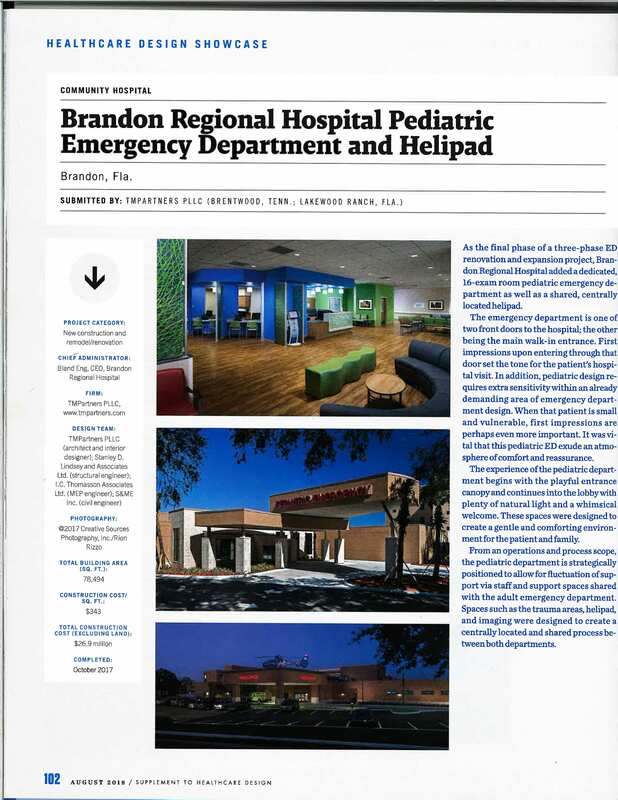 TMP project Brandon Regional Hospital Pediatric Emergency Department and Helipad was very honored to be featured in Health Care Design Magazine’s most recent Healthcare Design Showcase. This marks the eleventh year in a row that TMP has been featured in their showcase. As the final phase of a three-phase ED renovation and expansion project, Brandon Regional Hospital added a dedicated, 16-exam room pediatric emergency department as well as a shared, centrally located helipad. The emergency department is one of two front doors to the hospital; the other being the main walk-in entrance. First impressions upon entering through that door set the tone for the patient’s hospital visit. In addition, pediatric design requires extra sensitivity within an already demanding area of emergency department design. When that patient is small and vulnerable, first impressions are perhaps even more important. It was vital that this pediatric ED exude an atmosphere of comfort and reassurance.